There are some days I just feel sorry for interns. Basically, they are book smart doctors with no real world experience. Yet, they willing put themselves at risk for a clobbering at any given moment. Sunday morning, while Doc H is in the shower, his cell phone rings and eventually quiets going unanswered. However, that noise is shortly followed by the piercing beep of his pager. He jumps out of the bathroom. He returns the page using his cell phone (God forbid anyone from the hospital captures our home number) with his usual greeting, "This is Doc H. Someone paged me?" I can barely make out a young woman's voice muted by the cell phone case. She quickly reports of what she knows of the patient and the situation at hand. She sounded confident, competent. Then Doc H began his line of questioning to gather information needed for further evaluation. She unraveled, stopping the conversation to go ask others for answers, all while Doc H stood half dressed in our bedroom. From my end, the calm, but rapid fire conversation went something like this..
What size stent? No, that's the needle size. What's the stent size? What the patient's INR? We need to know that. Was ultrasound guidance used? You don't know that either? Who's the attending? Okay, we'll have to put this case under review. I'll be by to see the patient. And I cringed. During the conversation, I was cheering that young lady on, c'mon you can do it! Because if it were me, my voice may have cracked a time or two during the phone conversation. My nerves may have worn me down. But all I can make out from the other end, is a weak little, "Ok, thank you." When Doc H hung up, I asked, "Was that a resident?" "No, an intern! They shouldn't have an intern calling. They shouldn't be put in that position!" I was so happy to hear him say that. I sincerely hope that intern is not crying in the ladies room as I type this. Because, I'm pretty sure I would be. 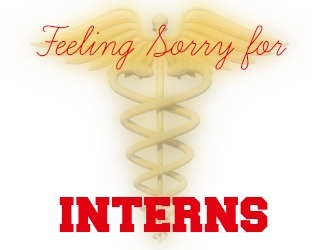 Let's all take a moment and feel sorry for the interns, shall we? So glad we start getting clinical experience from the beginning of the third year of our six year course... there's a lot of things bad when you study meds in South Africa, but the intensity of clinical training is not one of them (or, it could be, considering maybe 21 year olds shouldn't be performing the things we are expected to do). Anyway, I suspect our interns struggle as much: it's not just about the experience, but about suddenly being in the position to make decisions. Thank you so much for posting this! My husband is a 4th year resident in Ortho, but I remember the Intern days well - I always felt sooo bad for him. Major kudos to Doc H for the way he handled it and for not screaming down the Intern! Unfortunately for most interns they need that kind of hammering to get up to speed, but having been on the other end of a conversation like that and seeing my husband get lower and lower as he didn't know the answers to questions... it was just sad! I agree! No intern should ever have to call an attending - where is their chief resident?